You might have heard about Smart Refrigerator which can automatically order the food items which are running low in refrigerator, so inspiring from that we are here building a Raspberry Pi Smart Container using Load Cell and HX711 Weight Sensor. This Smart Container can tell you about its status like whether it is full or empty, by sending a mail to your Email ID. We can also monitor the weight of container in real time using web browser, and that’s make it a IoT project where you can monitor your container from anywhere using internet. Here the weight of the container will be updated in every 5 seconds on the web browser, this duration can be easily changed in HTML code file. We have set the threshold weight value of 300 gram to send the email about that “Container is Full”, this limit can also be changed. Check the Video at the end of this tutorial. If you are not familiar with Load cell and HX711 module check our previous projects Raspberry Pi Based Weight Sensing Automatic Gate and Arduino Weight Measurement using Load Cell and HX711 Module. Here we have attached a wooden base with the Load cell for stability, with the help of nuts and bolts, as shown below. Learn more about Load cell and HX711 weight sensor module here. After installing libraries, user needs to open ssmtp.conf file and edit this configuration file as shown in the Picture below and then save the file. To save and exit the file, Press ‘CTRL+x’, then ‘y’ and then press ‘enter’. Below is the snapshot of Alert Emails which we got during our testing. Here, we have created a web server, which provides a way to send the Weight Value of the container from Raspberry Pi to network using Flask in a web browser. Flask allows us to run our python scripts through a webpage and we can send & receive data from Raspberry Pi to web browser and vice versa. Flask is a microframework for Python. This tool is Unicode based having built-in development server and debugger, integrated unit testing support, support for secure cookies and its easy to use, these things make it useful for the hobbyist. You can learn more about the programming using Flask here, also check our previous project where we have used Flask to send the message from Webpage to Raspberry Pi. Connections for this IoT Smart Container are easy and schematic is given below. 16x2 LCD pins RS, EN, d4, d5, d6, and d7 are connected with GPIO pin number 18, 23, 24, 25, 8 and 7 of Raspberry Pi respectively and HX711 Module’s DT and SCK pins are directly connected with Raspberry Pi's GPIO pin 27 and 17. Load cell connections with HX711 module are already explained earlier and also shown in the below circuit diagram. Working of this Smart Container is easy. In this project, we have used Raspberry Pi 3 to control whole the process. Load cell senses the weight of the container and supplies a electrical analog voltage to HX711 Load Amplifier Module. HX711 is a 24bit ADC, which amplifies and converts the Load cell output into digital form. Then this amplified value is fed to the Raspberry Pi. Now Raspberry Pi calculates the output of HX711 and converts that into the weight value. 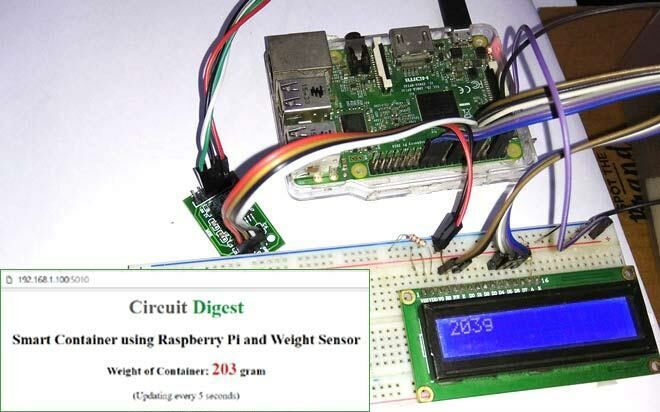 Then this weight value is compared with the predefined threshold value (300 gram) using Raspberry Pi and Python code, if the weight of container goes beyond 300gm then Raspberry Pi sends a email stating that "Smart Container Alert.... Container Full". And if weight remains under 300gm then Raspberry Pi sends email stating “Smart Container Alert.... Container is Empty”. The weight can also be monitored using web browser, you just need to open your Raspberry Pi IP address with port 5010 like http://192.168.1.100:5010 (replace IP address with your address). Here we have used Flask to send the data from Raspberry Pi to webpage over the network. This page will automatically refresh in every 5 seconds and we get updated data, for this we have used jQuery as explained earliar. A optional 16x2 LCD has also been used to display the weight and status messages. Complete Python code is given below, where we have written functions for driving LCD, for reading weight value from Load cell, for displaying data on webpage etc. You can understand them easily or if you are a beginner then check our previous Raspberry Pi Tutorials. msg = "Smart Container Alert.... Container Full"
msg = "Smart Container Alert.... Container is Empty"
Hi, i am going to attempt this project but i am fairly new to the whole Raspberry Pi programming side of things. Is there a way to use Push notifications instead of or as well as emails for when certain weights are achieved? Please can you help me out with this as it has brought me to a complete stand still and i really want to finish this. I can not get a steady weight like you have on the web page? Please can you let me know where i am going wrong and how to rectify this? Hi steve save your breath, it seems like sadam is not supporting this post and from what i can tell the project doesnt seem to work anyway? As with Steve Above, i cant seem to calibrate the scale and am getting random weight values back in the range of -3500 to -100. I also had few problems to get start with a load cell. Finally I found out that it all depends on how we mount the load cell. As sadam has shown here it is very important to fix one end of the load cell to a constant base with nuts and bolt. Can you post the code you are using here so i can try it and see it it makes a difference along with the pins you are using on the pi please mate? Hi Aisha, i would also like your code to please, and also if possible pictures of the wiring for your lcd screen specifically at the resistor as i cant seem to get mine to work? Hi Aisha, no Joy, i got a slightly smaller range of numbers but they are still completely random? The Web.html has to be constantly open or your script freezes after 4-5 hours until it is opened and then carries on as normal until you close the web interface at which point a few minutes later it freezes again. id there a fix for this? Hi can you show me how you wired up the screen? im dont know how to read the diagram used here and just want to repoduce using the screen? i have completed the project which was simple enough but didnt know how to wire in the screen. i need some help in this project. Bro i have just now started the project. u mentioned that u have already completed it. Please provide me with ur email adsress. please help me.